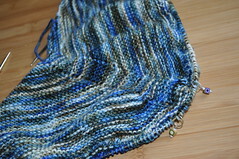 Before Hurricane Irene hit, I figured I'd better find some Storm Knitting to do -- something that would lend itself to knitting in low-light conditions if we lost power (since everything else I'm knitting at the moment requires actual light). 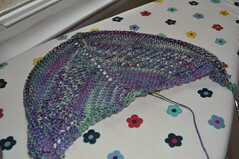 It took me a while to find something, but I finally settled on a pattern in my queue: the Storm Cloud Shawlette. Appropriate, no? As it turned out, it's a good thing I did this - we made it through the entire storm just fine, only to lose power at 10pm on Sunday night, long after the rain and winds had stopped. Go figure. We had 48 hours without electricity. My mother-in-law, who lives nearby, DID have power, so we showered there in the mornings and had dinner there after work, but then went home for bedtime. Jim read with his favorite booklight, I knitted by candlelight. 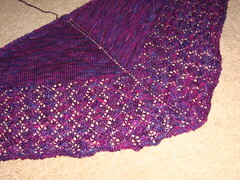 And over the course of the outage, I knitted most of this shawl, finishing it in the next week. 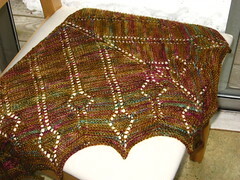 ...to this shawl. 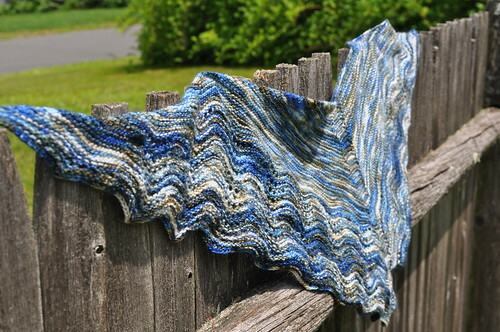 It was really a good choice for this pattern; it's very light and drapey, but warm, and it striped ever so subtly, which works well with the semi-circular shape. 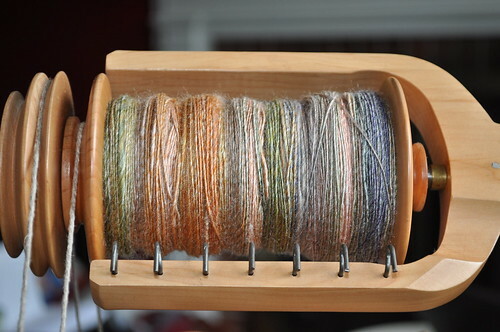 And I'm very pleased with how consistent the yarn was -- the plying was mostly very even, and the thickness pretty uniform too. 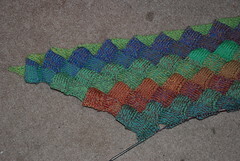 The yarn was heavier than the yarn called for in the pattern, so I knitted this on pretty big needles - 10s, I think. 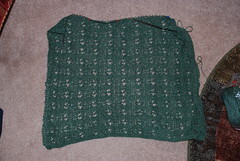 And truthully, I didn't have quite enough yarn -- I only managed to do a couple of rows of the ruffle after the final increase (rather than the 12, I think, that was called for) before needing to bind off -- and I literally had about two inches of yarn remaining after binding off my final stitch. 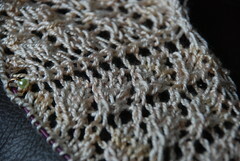 So it's more of just a little flourish than a full-on ruffle, but this is a forgiving pattern so it doesn't matter. 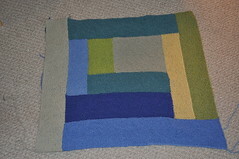 First, the Moderne Baby Blanket. It's going! 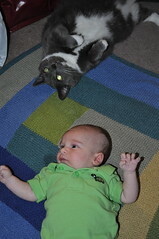 It felt like I was stalled for a long time, but then suddenly it got bigger all of a sudden. 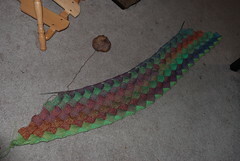 I'm somewhere in the vicinity of two-thirds of the way through it right now, depending on what exactly the final size ends up being. 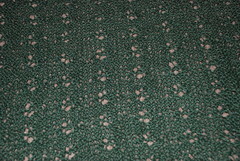 That beige block on the left blends in quite nicely with the carpet...heh. This is currently measuring about 23"x29", so I've got about seven inches left to go in either dimension to hit my target size of 30"x36". 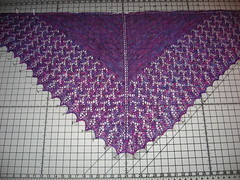 I'm not married to that exact size, though -- we'll see how it's looking as I add more blocks. 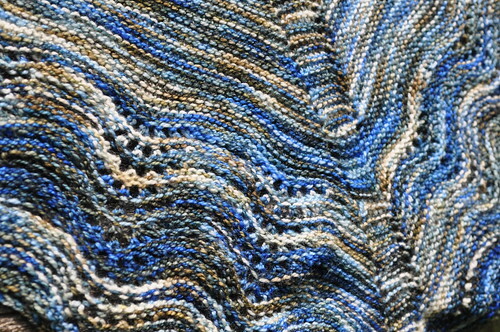 I've just started another block in that maize/gold color across the bottom (as this picture is oriented) and after that will come another dark blue block on the right side, I think. 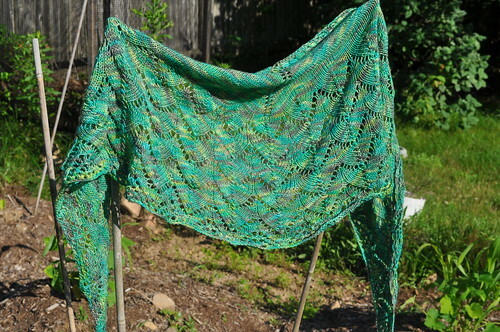 I needed something else to work on -- the blanket is monotonous and getting pretty heavy to boot -- so I cast on a Lavalette shawl in this lovely yarn that I got from Kris in her recent destash. 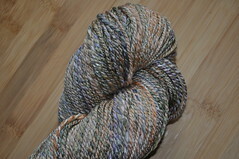 It's Fiesta Yarns Ballet, it's alpaca and tencel, and it's soft and lovely. 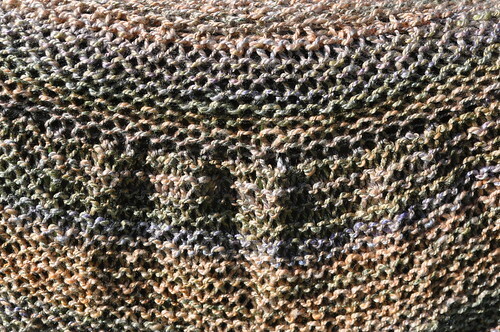 This is a pretty basic pattern -- just stockinette sections interspersed with openwork mesh -- but the yarn is so nice that it's really soothing to knit, especially after the nubbly cotton I'm using for the blanket. 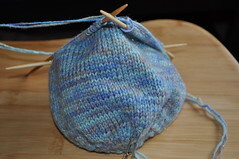 I have other things I want to cast on for RIGHT NOW -- another baby sweater (I've gotten it in my head that I want to bring the baby home in something I made for him, so I want to make a teeny-tiny sweater), and the hippo from Itty Bitty Toys! 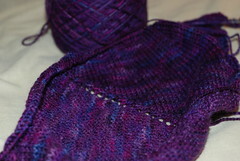 I've got yarn lined up for both projects -- must get started! A few entries back, I introduced you to the purple blob - Ishbel. Well, Ishbel has been past the blob stage for a while now, but she hasn't gotten her day in the spotlight yet thanks to my poor blogging of late. 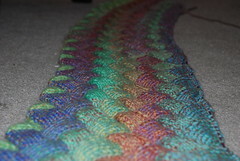 Blocking really is magic. 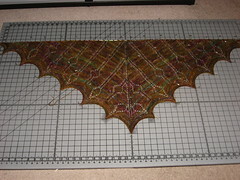 I think this is the first time I've really blocked lace, and despite my issues with the scalloping, it was fun! 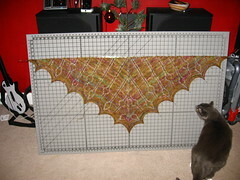 And not only did it open up the lace, it really made the shawl larger: pre-blocking it measured about 17” deep and 50” across the top, unstretched, and post-blocking it's about 24” deep and 60” wide. 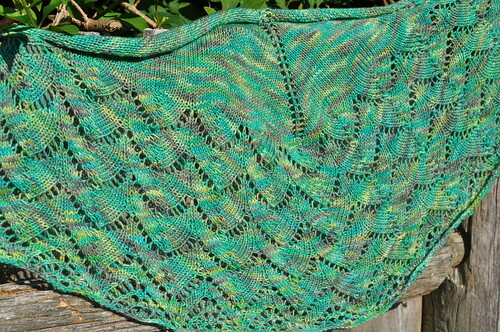 It's a perfect size to wrap around my neck like a scarf (plus it stays on better that way than it does if I wear it like a "proper" shawl). No action shots, though; sorry. 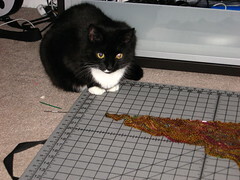 I'll try to work on that (though first I have to get her back from my MIL -- I accidentally left Ishbel at her house a couple of weeks ago!). 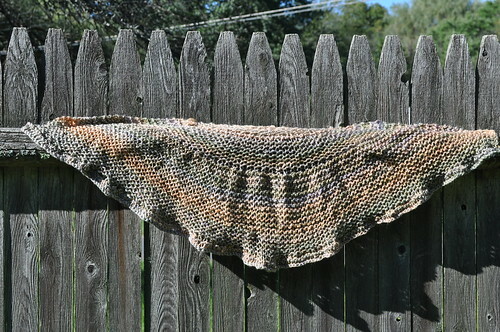 I knitted the "large" size shawl. The skein of yarn I was using was 550 yards, and I had quite a substantial ball left over -- so my initial fears about running out of yarn were unfounded. While I was in Washington, I cast on for Ishbel by Ysolda Teague. 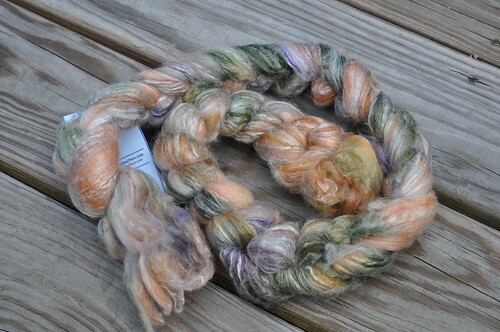 I'd had this skein of gorgeous yarn in my stash for -- well, for a long time. 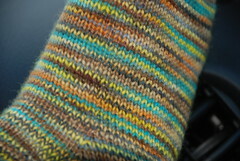 I bought it on eBay, back before Etsy had been invented (though the seller is now an Etsy shop), when I was a brand-new knitter. 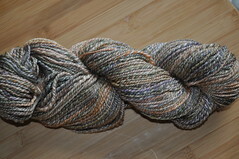 In fact, I think it might have been the first yarn I ever bought online, although I'm not entirely certain. 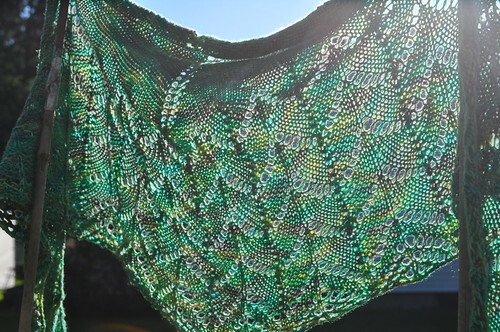 I never had any real idea what I wanted to do with it -- I bought it just because it was pretty, and at 550 yards it was way more than I needed for a pair of socks, so I was holding out for something different -- but as soon as I saw Ishbel I knew that that was what it needed to be. 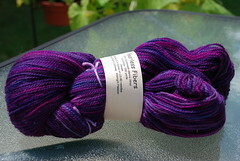 The yarn is Fearless Fibers sock yarn in "Midnight Passion" and it's a beautiful semi-solid purple, with lovely shades of indigo and violet. 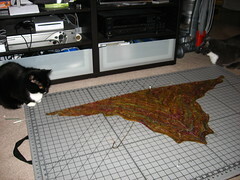 Right now, of course, the project is still in the "blob" stage. 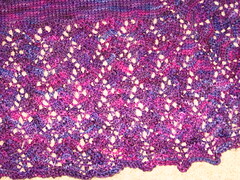 I'm farther along than I was when I took this picture -- I'm into the lace portion now -- but I suspect an updated photo would not look much different. It may be a blob, but it's a really pretty blob. Actually, I ran into a snag today. 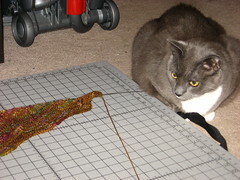 I was knitting along -- I had completed chart A and was motoring along on chart B -- when suddenly, at the end of a row, I was off by one stitch. 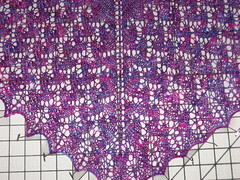 And, sadly, whatever my mistake was, it was NOT on the row I'd been knitting, so there was no tinking back (I can't tink back multiple rows in lace). 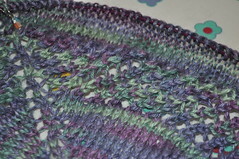 Luckily I had been using a lifeline, but unluckily, the lifeline was five rows back (at the beginning of the chart) so I lost almost an entire chart's worth of knitting. 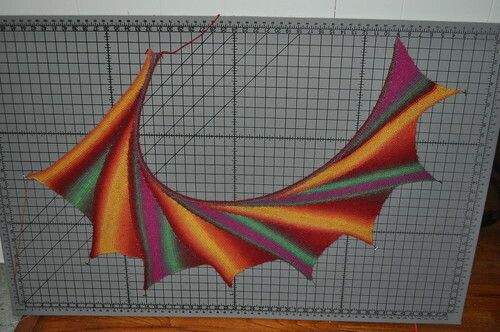 I ripped back and have gotten everything back on the needle (or so I hope -- need to double-check that) but haven't started reknitting yet. Sigh. A minor setback to be sure, but still, no one likes backwards progress!